What was I thinking when I decided to pre-heat the oven on one of Florence’s hottest summer afternoons? It was all in the name of photography, actually. I suppose I could have decided to photograph something that didn’t involve turning on the oven. 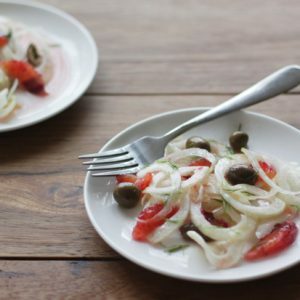 I could have done a panzanella, or rearranged some slices of proscuitto e melone on a plate, but I wanted to capture something that was not only quintessentially Tuscan but something that also represented the idea of conviviality: food bringing people together. I figured you can’t go wrong with cookies, especially cantuccini di Prato, the famous Tuscan biscotti named after Florence’s neighbour. With conviviality in mind, I imagined how many Tuscan dinners I’ve shared with friends and how practically all of them ended with a plate of cantuccini accompanied by a bottle of vin santo and those mini tumbler-shaped shot glasses, with much dunking, drinking, eating and lingering – perfect for when you’re just not quite ready to get up from the table. I also thought of the time I introduced my mixed Australian and Japanese family to my new Italian one. For some reason, dunking cantuccini in a glass of sweet, sticky vin santo became one of the easiest of Italian table habits to learn, and even when there was no common language at the table, crunchy biscuits helped fill the room with smiles and an ease that had no language barriers. Well, maybe the homemade vin santo also had something to do with it. 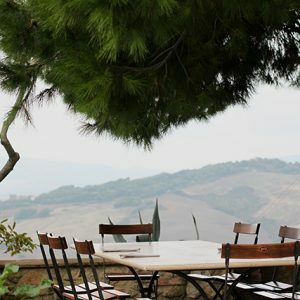 The idea of food bringing people together happened to be the theme of the recent ToscanaIn English night, a coming together of expats and Tuscans to talk about our cultural differences, appropriately, over drinks and nibbles. I was asked to prepare a slide show of some of my photographs. 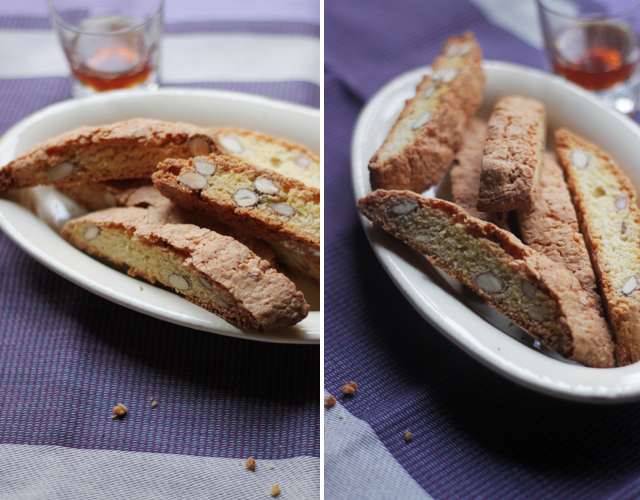 I thought it would be fun to take photos of the cantuccini to not only illustrate the theme but it also shows what it is I love doing for my blog: I cook, I style, I photograph and then I eat – usually with friends, who reap the spoils of many a blog post. In the end, the slide show became a video recipe of sorts – a first for me, so any feedback is welcome! Below is the actual recipe, though I should mention that the recipe for Cantuccini has thousands of variations. The one I use is a fairly standard modern version, although not everyone adds vin santo to the dough. The original 19th century recipe for cantuccini di Prato once included pine nuts as well as the almonds and did not have any raising agents or butter, something that differs from almost all modern recipes. 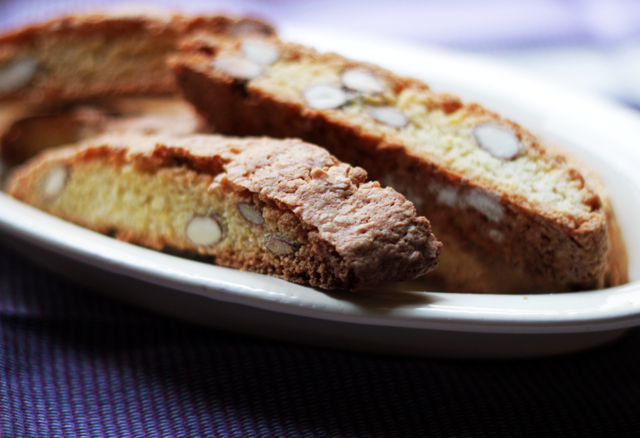 A note on biscotti: The Italian word for biscuits or cookies, biscotti, comes from the fact that these cookies are twice (bis) cooked (cotto), a technique that Pliny the Elder once said would keep baked goods edible for centuries. They are first shaped into a sort of flat log, baked, then cut into slices and baked again. The double baking makes them durable and crunchy (perfect for withstanding a good dunking into vin santo or coffee). I personally am a fan of soft cookies (always have been and always will) so I have a tendency to take them out of the oven a little sooner than they should be, with much constructive criticism from Tuscans. It has never stopped them finishing off the whole plate of them, though. Preheat the oven to 180 degrees Celsius. Arrange the almonds on a baking tray and pop them into the oven for 5 minutes or until lightly toasted. Set aside to cool. Sift the flour into a bowl and create a “well” in the centre. Crack the eggs into the well and beat, much the way you make handmade pasta. Add the rest of the ingredients and mix well (I personally like to do this with my hands but if you don’t want to get dirty, you can use a mixer, just be careful not to over mix – stop when the mixture is just combined). Split the dough mixture into two or three sections. Shape the dough into logs and place on a baking sheet lined with baking paper. They can be thin (about 5cm wide) or double the width for larger cantuccini. Note that they will expand quite a bit in the oven, so leave plenty of space between them on the baking sheet. Bake for about 20 minutes or until golden. Remove the cantucci from the oven and while warm, slice the logs at a 45 degree angle into cookies about 1-2cm wide. Place these cookies back in the oven for another 15 minutes or until crunchy and golden. 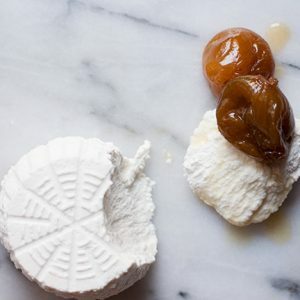 Allow to cool and serve with a small glass of vin santo or other dessert wine for dipping. They keep well in an air tight container. Now, if you’re making these in the summer and you’ve just sweated away with your oven on to bake them (twice, no less! 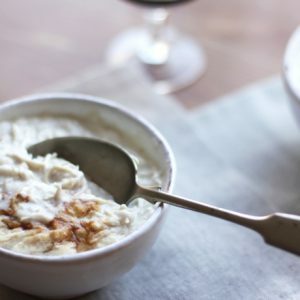 ), think of the summery ways you can use your cantuccini: my favourite is to crush a couple of biscotti into a bowl, add a splash of vin santo and let them sit for a few minutes to soak and become cake-like then stir it through vanilla ice cream. Heaven. Being a “pratese doc”, I can but love cantuccini! I’m sure you know Mattei’s cantuccini (or, as we say here in Prato, “cantuccini di Mattonella”). You’re right: there are lots of variations in the recipe. My mom’s cantuccini, for instance, are much softer than those you buy, but don’t ask me why. Anyway, they’re absolutely delicious!!!! Hi Rita – if you can find out your mother’s secret to soft cantuccini, I would LOVE to know! Hi Domenica! If you just bake the loaf once, then cut it up while warm the biscotti remain soft – it’s the second baking that makes them hard and crunchy! I have been planning on making Biscotti and this recipe is great .. i am considering selling them at the local Artists studio/Cafe here in Bermagui…where apart from great coffee ..he serves NO food !!! OMG. Will have to sell sly grog as well …Luckily the Bottle shop is next door to the Cafe. You’ll make a killing with these, Len! And why not a few chocolate covered strawberries while you’re at it? I baked your cantuccini and they are very tasty and cruncy as I like them. I needed a bigger amount of flour, about 100 g, than you have in the recipe! Thanks, lovely to know! The amount of flour can change depending on the size of the eggs you’re using. I usually use small-medium eggs, so if you’re using large eggs you might need more flour as it will be a wetter dough! Yesterday, there were no guests in our restaurant because of rain ,so we decided to make cantuccini from your site and Prato cookies from Juls’.After tasting we devided on equal parts, both cookies are tasty. Today the crew finished them with morning coffee. Thanks for recepi!! !